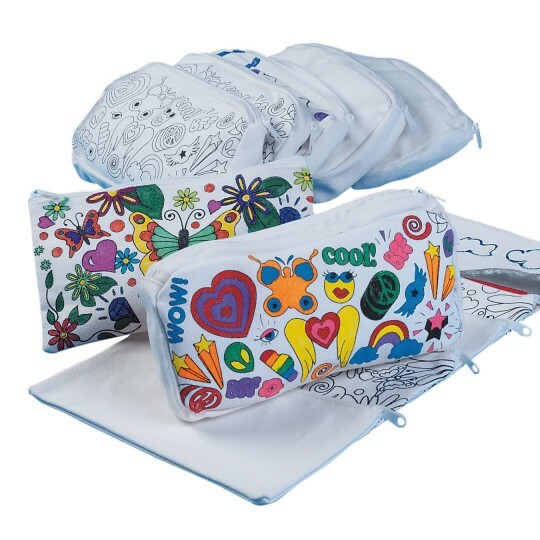 Each measures 8" x 4-1/2"; gusset measures 1-1/8"
Carry all your classroom essentials in a cute case. A fun coloring project for boys and girls. Three each of four 8" x 4-1/2" styles: "Cool Butterfly" with 1-1/8" gusset, "Flowers and Butterflies" without gusset, Plain bag with 1-1/8" gusset and Plain bag with no gusset. love the printed bags not such a fan of the unprinted plain bags but stencils work well with them. Our campers loved this activity. Making something they could actually use after camp was a great benefit. I likes how some were pre-printed and others were blank. We will use this in our Awana program to put gifts in for the kids. They will love these. The only thing I wish is that they had pictures on all the bags not just on some of them. But on that note I would use these again. The ones with no pictures I can put something on them my self and use them for our leaders. This product was used for seniors to decorate it is something they can use to hold their personal items in. Very convenient and they were proud of the outcome.